President of the United States Donald Trump, before the meeting with the head of the Russian state Vladimir Putin in Hamburg at the G20 summit said that he thought about Russia and what US policy would be towards Russian direction in his keynote speech at the Krasiński Square in Warsaw. Its quintessence is the following: previously, the West had one enemy, which was communism. Now, there are two enemies - Islamic terrorism and Russia. "They pose a threat to the West from the south and the east, they challenge the values of the West, and it is essential to eradicate them in the same way as it had been done to communism". After such a public statement, you can trust Trump no more than all those who previously wanted to destroy Russia, but failed. Trump's speech that was held at the Krasiński Square in Warsaw in front of the Polish authorities, who gathered, according to the old communist tradition of trusted and reliable activists of the ruling party,and waved flags and chanted at the right moment: "Donald Trump", still remains confused. Especially, it is more confused for Russia that had high hopes with Trump’s arrival to power in the United States. It seemed that there could be nothing worse than Obama and Clinton. However, it could be. And these doubts might exist, because few people, apparently, listened to the end of the long speech of the American president, who flattered the Poles and Poland. Trump said that "America loves Poland and the Polish people," although most Americans know little about Poland and are unlikely to be able to find it on the map of the world. He called the Poland as "the soul of Europe," "the land of heroes," and so on. He repeated the word "spirit" many times. 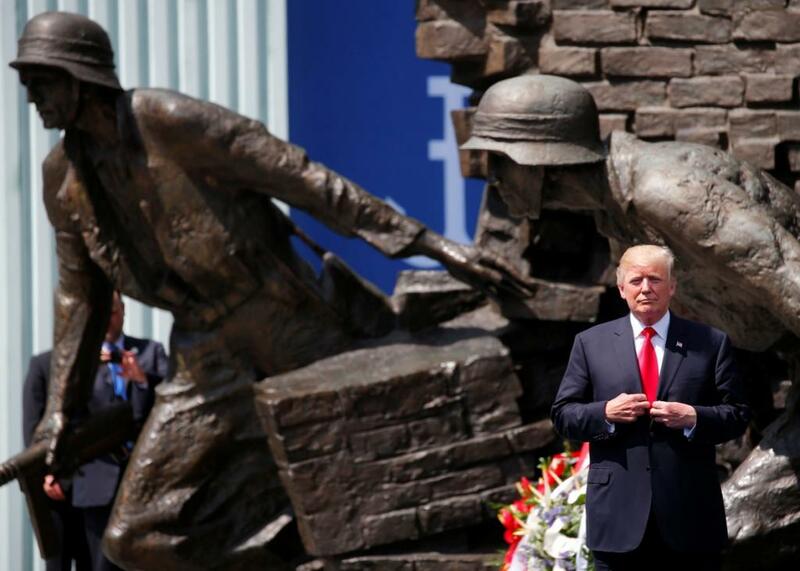 The US president, who also made a "geographical discovery" in his speech, because he called Poland "the country of Central Europe," delivered a lecture on Polish history. He was very selective when he was speaking about the history and could not resist falsification. Meanwhile, Trump gradually approached the most striking part of his speech. He noted the role of the Polish Pope Ioanne Paul II in the collapse of the communist system in Poland (and, of course, without mentioning that for this Cardinal Wojtyla, they had to clear the Pope throne and use the methods of the special services to eliminate Ioanne Paul II, who did not want to play political games) and said: "And today the West also opposes the powers that want to test our will, undermine our self-confidence and challenge our interests." The US president prepared the audience to openly identify the enemy and accused him of "aggression, including propaganda, financial crimes and cyberwar". He urged the US allies to resist this "on all new battlefields." After that, the US president laid out all the cards on the table: "We call on Russia to cease its destabilizing activities in Ukraine and elsewhere, its support of hostile regimes in Syria and Iran, and instead to join the community of responsible nations in our struggle against common enemies and for protection of civilization." Trump’s appeal simply surprises with his cynicism. Calling Russia and Islamic terrorism (which, by the way, the Anglo-Saxons themselves initially engendered to fight Arab nationalism and then to oppose the USSR in Afghanistan) as two enemies of the West, he invited Moscow to take part in the fight against terrorism under the auspices of the United States, although the Russians have been doing this quite successfully for a long time - both at home and in other countries, unlike Americans, who, on the contrary, engender terrorism by their policies, wherever it is possible. The US president stressed the need to stop the "forces from the south and east" that are supposedly attacking the West and want to undermine Western traditions and identity, "our courage, our spirit, and weaken the will to protect our society." Trump further proclaimed: "These forces are doomed to fail if we want them to fail, and we really want them to fail." Russia is accused of willing to destroy the European identity and tradition and this accusation is simply outrageous, because the last adherents in the West keep literally staying Moscow and see Russia, not liberal postmodern societies and their own ruling class, truly commit to traditions and Christianity, and have the courage to defend its beliefs. Then, Trump smoothly moved to call European countries for spending more on NATO, which the US rule, and declared in conclusion: "The West will never be broken, our values will triumph." However, Western Europe considers Trump as the main threat to Western values. Trump extended his anti-Russian theses at a joint press conference with Polish President Andrzej Duda,. He offered the Poles massive supplies of American liquefied gas, "so that you will never be a hostage of a single supplier or, as we sometimes say, a monopoly." In other words, the US president blamed the Gazprom, which supplies Poland with 10 of the 15 billion cubic meters of gas consumed every year, and turned the Poles into hostages, although the Russian "monopoly" has always reliably fulfilled all its obligations. It is very indicative to hearTrump's oath that promises that the US will never engage in gas blackmail, which they apply to Russia. A gentleman and a decent person would never have dreamed of giving such a promise, because he simply cannot imagine such a thing that he or his country is doing something like that. By the way, Trump’s promise to turn Poland into a gas hub for the whole of Europe by the American aid and remove the Gazprom was taken enthusiastically by the Poles for one instant. Having told that the first LNG tanker came to Poland in June and that there would be much more soon, the US president warned: "We will have to raise prices a little, but that's nothing." The businessman Trump was so carried away with rhetoric and saying that "a lot of new additional contracts" will be concluded and that "very soon we will be very great energy exporters" because "these incredible wealth is right under our feet" that he did not bother to visit the memorial at the former Jewish ghetto, which rebelled in 1943 against the Nazis. By the way, when the Jews appealed for help to the Army-oriented Army Craiova, it calmly refused to help and consideredthat the uprising of the doomed was untimely. And the same people took offense at Moscow a year after when, for purely objective reasons, it did not actively help the Warsaw Uprisingthat was not coordinated with her. So, since 1989, all the presidents and vice-presidents of the US have been visiting this memorial during their visit to Warsaw. Trump decided to send his beauty-daughter Ivanka there instead of himself and engage in more important affairs - gas and Russia and this behavior offended not only Polish Jews.